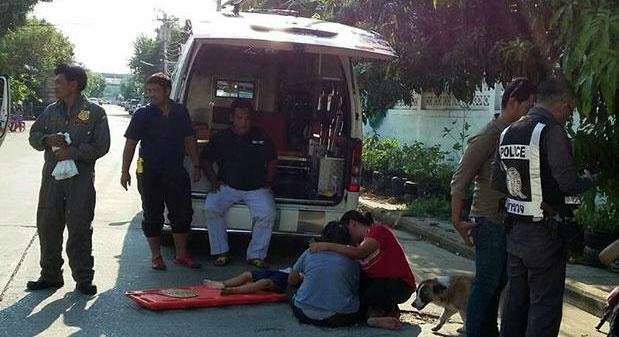 BANGKOK: A three-year-old kindergarten girl died on Wednesday in asphyxiating heat in a school van for more than seven hours after the driver and his assistant forgot her when they stopped at a housing estate in Samut Prakan. Palimprapa “Nong Ing” Pajjaiyo was found lying face down on the floor between the farthest back seat and the rear tailgate door of a Toyota van parked in front of Denchai Samakkhi housing estate in Muang district at about 3pm. Pol Lt Col Pisoot Chantarasuwan, deputy chief of Bang Pu police station’s investigative unit, said Arthit Rangsiyo, 30, the van’s driver, and his assistant Sathit Suwannachak, 33, picked up Nong Ing and 12 other kindergarten pupils who live in the housing estate in the morning to take them to Khlong Krabua school located only three kilometres away. Mr Sathit’s job is to take care of the pupils in the chartered van. After all of the children were seated in the van, Mr Arthit found the air-conditioner was out of order, so he parked the van on the roadside in front of the housing estate and asked his friend to get another van to collect them. Mr Athit and Mr Sathit admitted that they did not do a head count to see if anyone was missing after they moved all of the children into the second van. They then closed the van’s sliding door without realising Nong Ing was still inside. It was believed the child, who was three years and five-months old, was sleeping on the farthest back seat at that time. The men told police it was chaotic when they were leading the children to the second van as some of them were crying as it was only the second day after school opened. The pair discovered that Nong Ing had disappeared after they returned to the school at 2pm to take the pupils home. They called the young girl’s mother Thanatcha Pajjaiyo, 34, to check with her about Nong Ing’s whereabouts. They then went to check at the parked van and found the young girl had died. The pair have initially been charged with carelessness causing death. Mrs Thanatcha said Nong Ing was the youngest of her five children. After taking Nong Ing to the van, she went to open a grocery shop at a nearby market. In May 2013, Suriyakarn “Nong Potter” Phakan, a three-year-old boy in Si Sa Ket died after being left by his teacher for seven hours in a converted pickup truck used as a kindergarten minivan. The toddler’s death came less than a month after two teachers at Anongvet Kindergarten School in Samut Prakan faced charges over the death of Manassanan Thongphu, a three-year-old girl who was left in a closed, hot van for several hours outside her kindergarten.